The state of Ohio’s landlord tenant act includes specific rules for the security deposit. These rules are meant to protect the rights of both landlords and tenants by explaining the obligations of each party. Specific terms include how much can be collected and how long a landlord has to return the security deposit after move out. Here are five security deposit rights in Ohio. Security Deposit Amount in Ohio? The state of Ohio does not set a limit on how much a landlord can charge a tenant as a security deposit. The landlord could charge nothing or could charge one million dollars if they wanted. Most landlords will charge between one and two months' rent. Why Can a Landlord Keep a Tenant’s Security Deposit in Ohio? Do Security Deposits Have to Earn Interest in Ohio? Not all security deposits in Ohio must earn interest. Tenants have the right to earn interest on security deposits that meet the following two requirements. Security deposits that are more than $50 or one month’s rent, whichever is greater. For security deposits that qualify to earn interest, the interest rate must be equal to five percent per year. The landlord is required to pay this interest to the tenant on an annual basis. Ohio's landlord tenant law sets a time limit for landlords to return their tenants' security deposits. Tenants in Ohio have the right to the return of their security deposit within 30 days of move-out. Each deduction taken from the security deposit. Specific reason for the deduction. For example, if a landlord deducts money from the security deposit for “cleaning,” this may not hold up in court. Even though the landlord could have meant, “cleaning for damages caused in excess of normal wear and tear,” if this is not specifically stated in the written itemized list, it would be interpreted as money withheld for basic cleaning costs, which is not an allowable deduction from the security deposit. 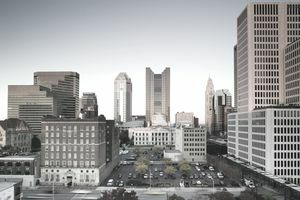 In Ohio, it is the tenant's responsibility to provide the landlord, in writing, with a forwarding address where the security deposit can be sent. If the tenant fails to provide the landlord with a forwarding address, the landlord will not be penalized for failing to return the deposit within the 30-day window. If the tenant has supplied the landlord with a proper forwarding address, in writing, and the landlord fails to return the tenant’s security deposit within the 30 day window, along with a written list of itemized deductions, if deductions have been taken, the tenant is granted certain rights. The tenant is entitled to the money owed to them, plus damages in an amount equal to the money wrongfully withheld plus any attorney’s fees. Transfer the security deposit to the new owner and notify the tenant in writing that the new owner is now in possession of their security deposit. What Is Ohio’s Security Deposit Law? For the actual text governing the security deposit law in the state of Ohio, please consult Ohio Revised Code Annotated §5321.16.